Ugly rashies is an innovative campaign launched by the Cancer Council of Aus. 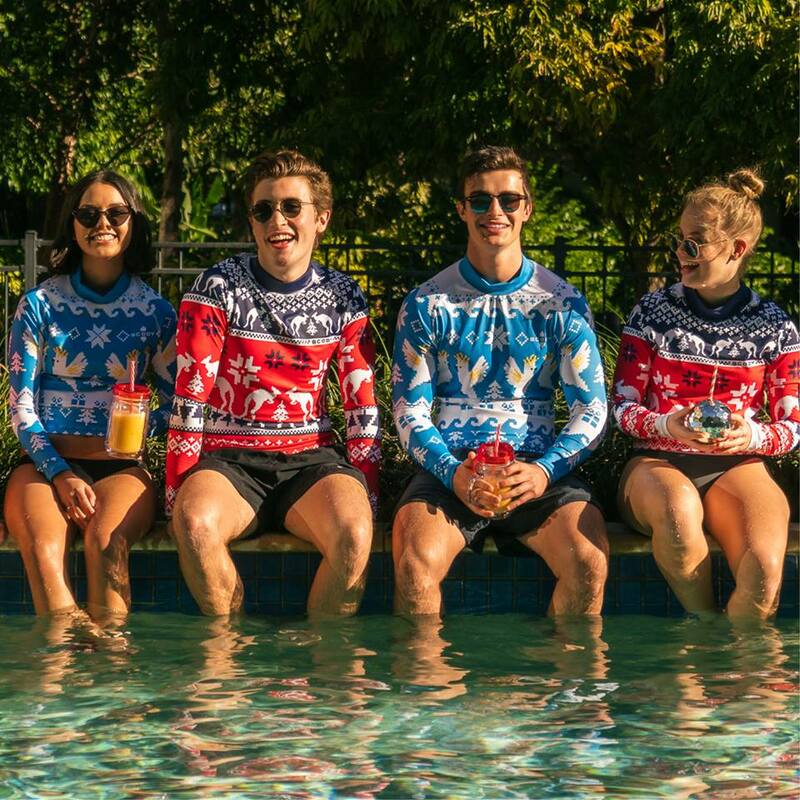 Aussies switch Ugly Christmas Jumpers for rashies and the effect is genius. Coastal towns all over Britain were looking a lot like planet of the cranberries after this bank holiday weekend. Some visitors who didn’t remember that the sun is a great ball of fire burnt in a series of comedy patches and then paraded unsurprisingly with pride. Yet there are just as many of us living by the sea who don’t wear enough sun protection, and we should know better. Two days of sun and suddenly everyone is at risk, especially in the water. Perhaps we could learn a thing or two from those Down Under. The Australian Cancer Council has come up with a genius piece of festive marketing to promote sun safety in time for their summer: The Ugly Christmas Rashie. Having been a raging success since 2015 when their launch saw stocks sell out in less than 48 hours, the Council have followed up their festive Kangaroo and Koala prints with a True Blue Cockatoo. Each long sleeved rashie has a 50+ UVF rating and cashes in at around $70 AUS per top, but the message it carries is worth it; cover up fools or the sun will get you. All profits from the sales go to the Cancer Council, who work to prevent, detect and treat cancer across Australia. According to Cancer Research UK, the South West has continuously boasted the highest rates of sun related skin cancer incidents in the UK, with Public Health England figures showing there was a 31.9% rise in malignant melanoma cases between 2009 and 2014. This growing trend hasn’t U-turned between then and now and numbers are still rising. So while there’s not much chance of them being needed here for the winter, maybe there’s room for a bit more humour when it comes to creative sun safety strategies in the UK.